The Doctor is erratically indisposed at this time. He has become obsessed with a concept in quantum physics called “entanglement.” He thinks it may be applicable to biology and explain some of the mysteries of migratory bird navigation. It is hard to distract him from the subject. Nonetheless it is my pleasure and privilege to respond to your astute obsevations. I am very pleased that you noticed our juvenile visitor last Sunday. I was surprised to see her too. She calls herself Abigail. David is quite enamored, but Jesse ignores her completely. The only thing Jesse wants to do is fish. Jesse thinks his father is the greatest, the greatest of all fishermen. This of course is true. If Jesse can become half my fisherman, he and his family will never go hungry. 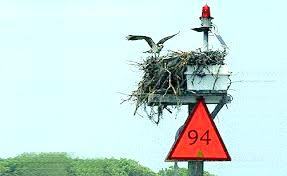 Abigail’s nest is on the first green channel marker on the North West side of middle marsh, marking the way into core sound. I think it is Number 64. It’s nearly 2 miles away, way outside of the territory Ozzie claims. Abigail seems to be a sweet girl, but she seems tough and determined too. 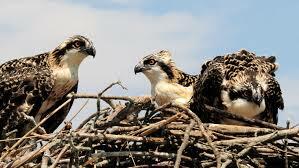 She has to drag David out of the nest to go fishing. Somehow Abigail and Jesse realized they have a not so easy migration just 3 or 4 weeks ahead of them. David appears nonchalant, not a worry in the world . Abigail is concerned David may be a statistic this time next year. She is very fond of David and does not want this to happen. I have much more to tell you but I must leave the Doctor’s computer now. He and the Female H. sapien that lives with him are about to usurp the only 2 functional computers in the giant nest, so I must discontinue my telekinesis. However, I promise to get back to you soon to respond to some of your other inquiries. Lucinda from Tennessee, you have been a faithful friend from the beginning. I can’t tell you how much I appreciate your friendship.